PrecisionHawk joined emerging technology and innovation leaders along with the venture capital community at the White House Technology Summit to discuss technology enablers that will drive America’s growth. 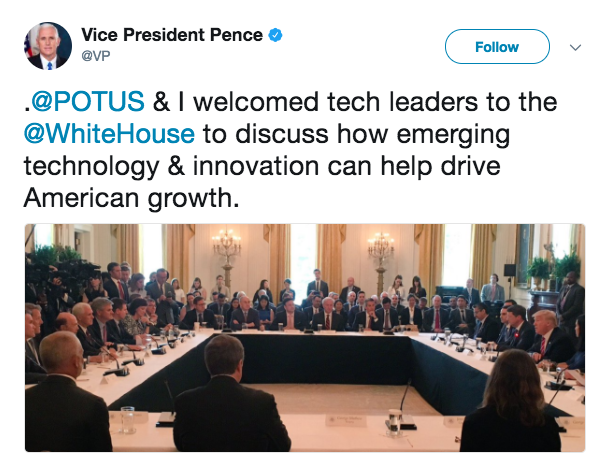 White House officials, including President Trump and Vice President Mike Pence, hosted drone makers, wireless companies and venture capitalists last Thursday in an effort to discuss how the administration can promote the development and commercialization of emerging technologies. PrecisionHawk was joined by colleagues from the drone industry including Trumbull Unmanned, Kespry and Measure who came together to advocate for progressive regulations that can position the US as the world leader in drones. “There is a lot of investment going into drone technology and drone companies here, but other countries are actually ahead of the US in their ability to deploy this technology,” said PrecisionHawk CEO Michael Chasen while addressing attendees during the drone breakout session at the White House. After the morning break out sessions concluded, President Trump joined the participants in a discussion surrounding policy, job creation, innovation and investment. Chasen noted that while some industries benefit from deregulation, the drone industry is actually seeking additional rules to enable growth, for instance rules that will allow for implementation of unmanned traffic management and package delivery. The request for enabling legislation is in line with recent requests for an exemption from the 2-for-1 Executive Order from drone industry stakeholders. The enablement of drone technology not only provides America with an economic edge in an increasingly competitive marketplace, but also supports several applications that are of interest to the administration such as border security and maintenance of the nation’s infrastructure. Monitoring and Protecting America’s Border: By outfitting drone platforms with sophisticated sensors, border patrol can quickly distinguish between natural and artificial features or detect distress in plants, sometimes a result of off-road border crossings. Surveying and Maintaining our Nation’s Infrastructure: By reinventing facility assessments and inspections with drone technology, we can improve workplace safety while capturing better information to quickly survey and assess conditions of an entire building envelope. This also allows us to monitor changes over time to stay proactive in maintenance of buildings, bridges, roads, parking lots and more. 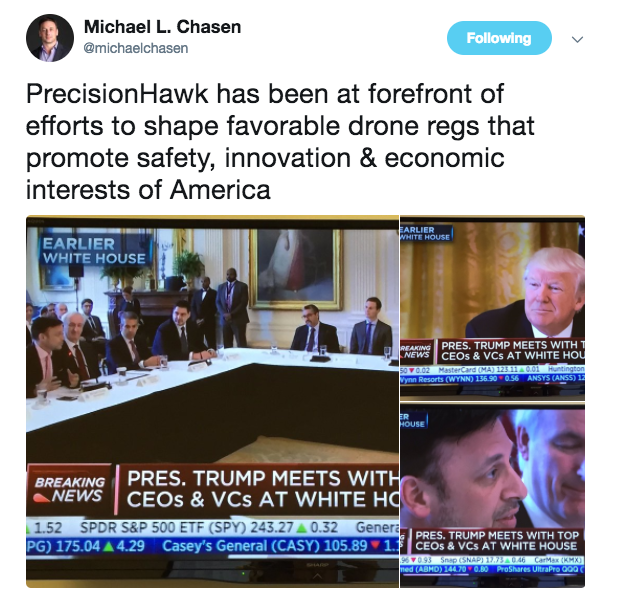 “PrecisionHawk has immersed itself at the forefront of policy and technology development efforts to help shape favorable drone regulations in America that both protect users of the National Airspace and the stakeholders beneath it, while promoting innovation and the economic interests of our country,” Chasen continued. PrecisionHawk has worked closely with the FAA under the Pathfinder Program, and also serves on the FAA Drone Advisory Committee and the FAA Remote Identification Aviation Rulemaking Committee. The PrecisionHawk team looks forward to working with the White House to promote forward-leaning regulations that will position the US as the global leader in drones.